You don't need any special settings on Yoga VPN, just a one tap connection. However, you need pointsto be able to browse with it. Please note that you'll need a little data or airtime on your sim to connect at first. So, follow these steps to get started. Firstly, download Yoga VPN here, open the app and tap on points. Scroll down and click on enter codes: Input imbbij to get free 9000 points. Now click on more, tap on Proxy Settings and toggle on the Per-APP Proxy. Finally, go back to VPN and hit the GO button to connect. You must have a little subscription or airtime on your sim to connect at first. 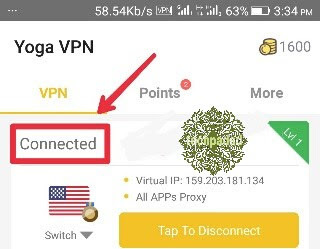 Yoga VPN will disconnect immediately you run out of point but the good thing is that there are different ways of getting more points. 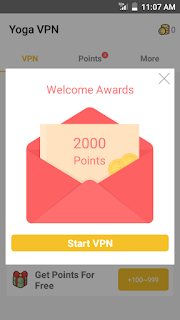 You get more points when you share your unique id or your Yoga VPN Invitation Code. Yoga VPN also gives you free 200 points every day which is called Daily Check-in. You also get more points when you watch the available videos.